Tie Luo Han is one of the Famous Five Wuyi Rock Teas and also believed to be the earliest Wu Yi tea; with history records dating back to Song Dynasty. The tea bush was first found in a cave (Gui Dong or Ghost Cave) in Hui Yuan Yan, one of the ninety-nine cliffs of Mount Wu Yi. Legend tells that this tea was created by a powerful warrior monk with golden-bronze skin, hence the name Tie Luo Han, which means "Iron Warrior Monk". A strong, rich and full-bodied tea that will warm your body and energize your mind. Traditional looking Oolong tea. 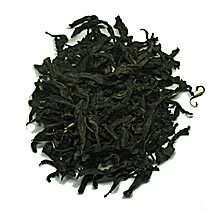 Dark and slightly curled tea leaves.